The green portion of our Community Foundation flower represents the mint harvested in Starke County. Indiana is one of the top mint-producing states in the U.S., and a large portion of that mint is farmed in Starke County. One of our towns, North Judson, holds an annual Mint Festival over Father’s Day Weekend, and every year when the fields are harvested, the entire community is filled with the warm, sweet aroma of mint. More than $50,000 and 44 scholarships were awarded to 28 outstanding students through the Starke County Community Foundation (SCCF) this year. In addition, the Lilly Endowment Community Scholarship will provide more than $107,000 for four Lilly Scholars attending college this year. The Starke County Community Foundation (SCCF) has awarded more than $285,000 this year to Starke County charitable organizations. Of that amount, $30,600 was given in community grants. 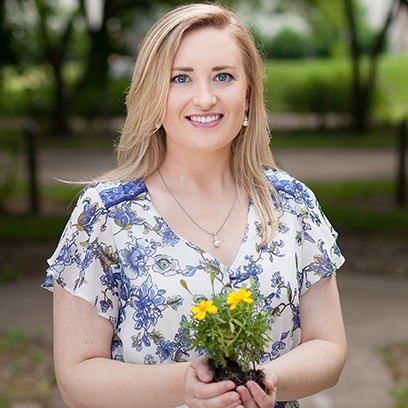 Jessica (Jessi) Martinović was the 2011 Starke County Lilly Endowment Community Scholarship recipient and a former NICF Marketing & Communications Coordinator as well as Management Intern. Jessica returned to the NICF after graduating from Valparaiso University and working in education. She has her Master of Arts in English and communications. Jessi Martinović, Dir. of Dev. Help Starke County children in need by providing preschool scholarships to North Judson preschools through this seedling fund. A seedling fund is one that is working to grow into a permanent endowment fund. This seedling fund was established in August 2006 by Starke County Lilly Endowment Community Scholars and parents to provide support to the Starke County Community Foundation. A seedling fund is one that is working to grow into a permanent endowment fund.